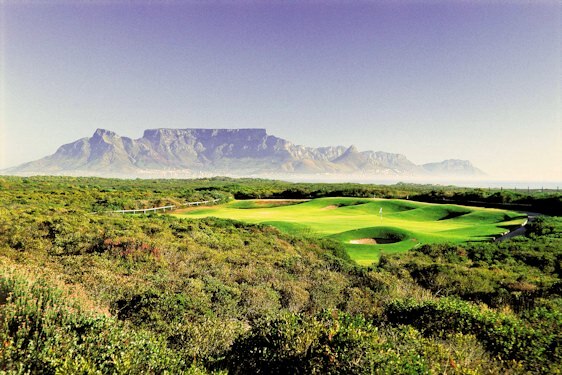 South Africa's alluring golf courses are scattered across the country from Cape Town to the Kruger National Park. 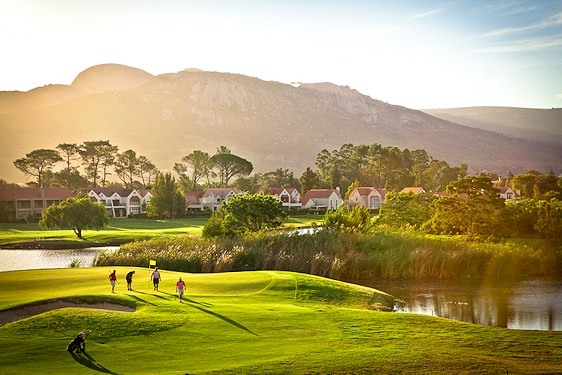 The Arabella Golf Course, with its splendid setting on the shores of the Kleinmond Lagoon, has for some years been considered one of the top courses in the Western Cape. Arabella is located about an hour's drive from Cape Town and is well worth a visit on any South African golf tour. A round of golf on Atlantic Beach Golf Course is sure to delight golfers of all skill levels. This links-style course is set on the shores of the Atlantic Ocean. It offers sweeping views of Table Mountain in the distance and is located a mere twenty minutes' drive from the city center. 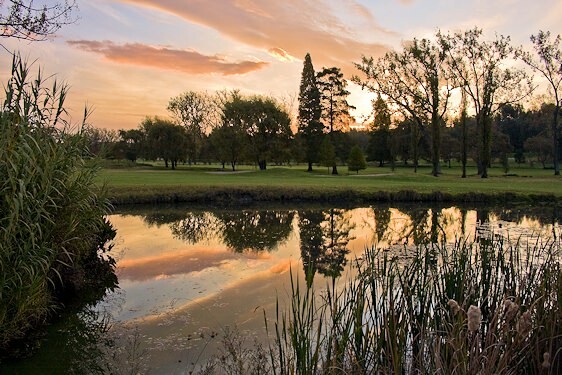 Boschenmeer Golf Course is located on the outskirts of the town of Paarl in the Cape winelands. 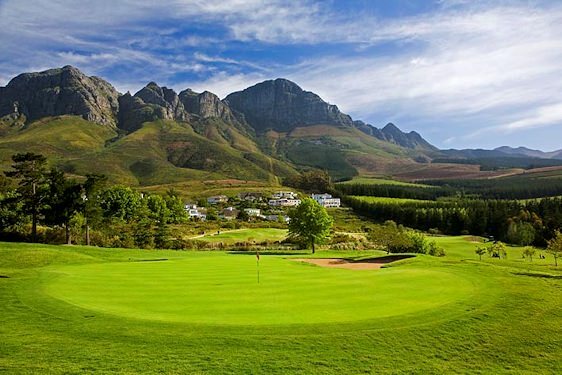 This Cape Town golf course is set against a backdrop of rugged mountain scenery and offers a challenging round of golf about an hour's drive from the city. Erinvale Golf Course is set at the foot of the Helderberg, with False Bay visible in the distance. This fine golf course has hosted the Golf World Cup; a first for South Africa. Erinvale can be reached from central Cape Town with a leisurely drive of about forty minutes. Mowbray Golf Course was founded in 1910. 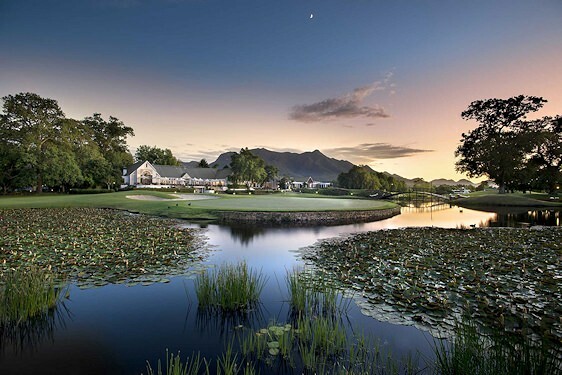 The course offers a manicured parkland setting with exceptional views of Devil's Peak and Table Mountain. Mowbray has hosted a great number of amateur championships over the years, including the South African Open, which it has hosted no less than seven times. Pearl Valley Golf Course is set in the heart of the South African winelands near the historic town of Franschhoek. The area is characterized by orchards and vineyards surrounded by the majestic Drakenstein, Klein Drakenstein and Simonsberg Mountains. 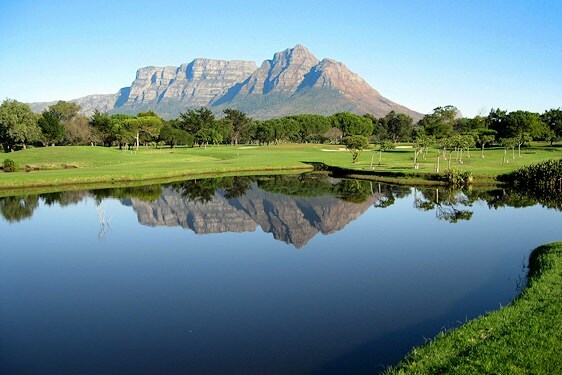 Pearl Valley Golf Course is a drive of about forty-five minutes from Cape Town. Royal Cape is South Africa's oldest golf course. It was founded in 1885 by a group of golf enthusiasts led by Lieutenant General Sir Henry Torrens. 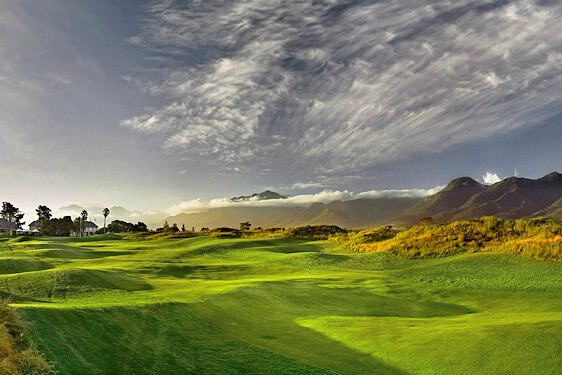 This Cape Town golf course has, over the years, delighted and frustrated generations of South African golfers, and is a must if your South African golf holiday brings you to Cape Town. 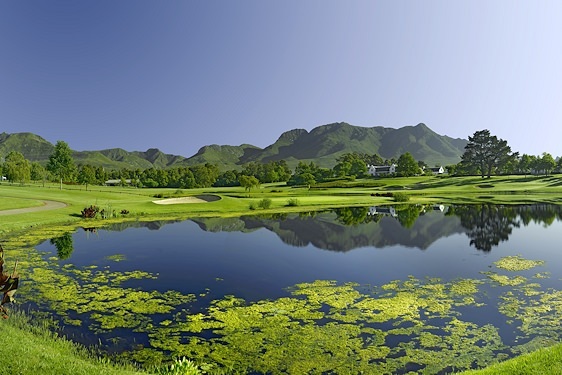 Steenberg Golf Course is a fairly recent addition to the golf courses of Cape Town. 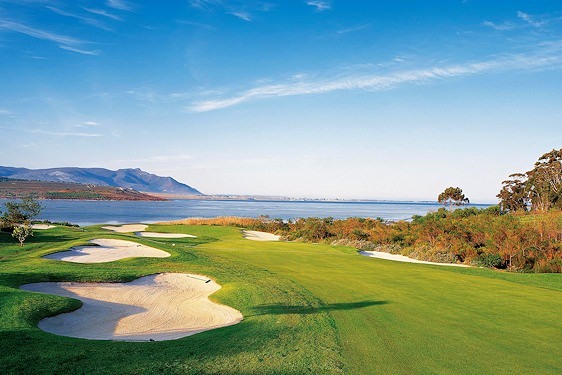 Steenberg has, however, already established itself as one of the most desirable golf courses in the area. It is ranked as one of the thirty-five finest golf courses in South Africa and definitely warrants a round when visiting Cape Town. 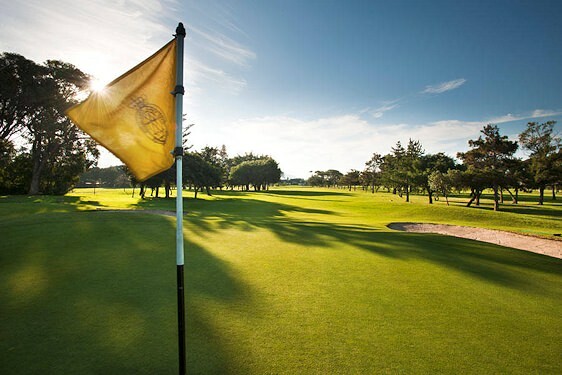 The Fancourt Links Golf Course has an international reputation as one of the world's most legendary and challenging layouts. 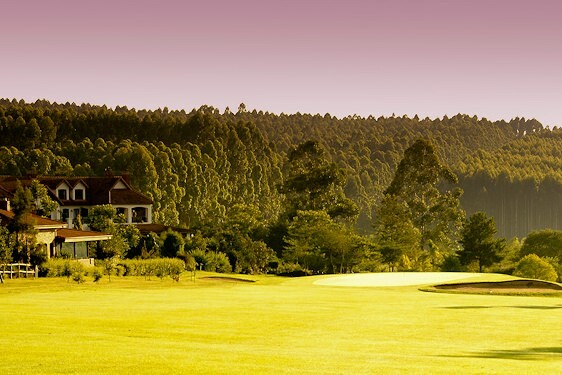 This Garden Route golf course consistently ranks as one of South Africa's finest and boasts the distinction of having hosted the Presidents Cup in 2003. The Gary Player-designed Fancourt Montagu Golf Course has, on numerous occasions, been ranked South Africa's top golf course. The picturesque layout is sure to challenge golfers of all skill levels and leave you wanting to return to once again pit your skills against one of the most memorable golf courses in the country. 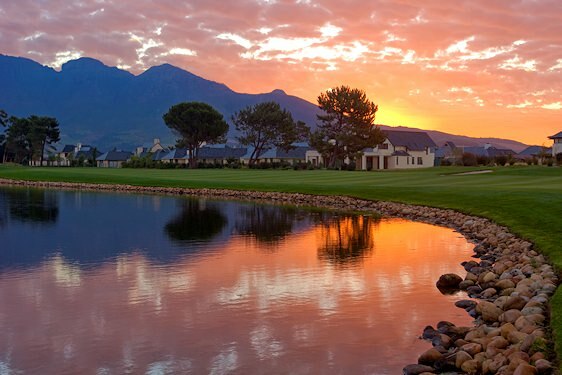 The Fancourt Outeniqua Golf Course has become legendary for its clever and varied challenges and the lovely surroundings in which it is set. From most holes, golfers will enjoy sweeping views of the Outeniqua Mountain range. 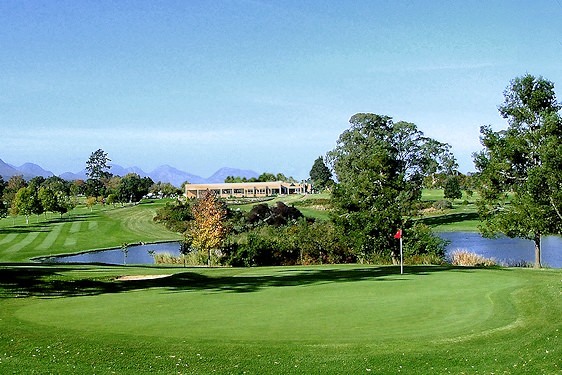 George Golf Course is a beautifully manicured parklands course set in the heart of the Garden Route. Golfers have a choice of either a caddie or motorized golf cart when booking a round at George Golf Course. 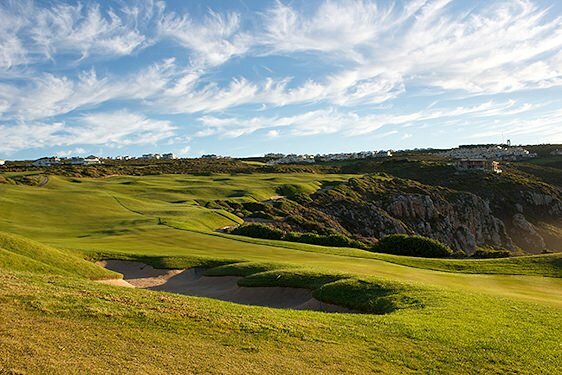 Oubaai Golf Course boasts an Ernie Els design with a splendid setting adjacent to the Indian Ocean. Oubaai will delight you with a challenging round of golf while enjoying endless ocean views to the south and breathtaking mountain scenery to the north. 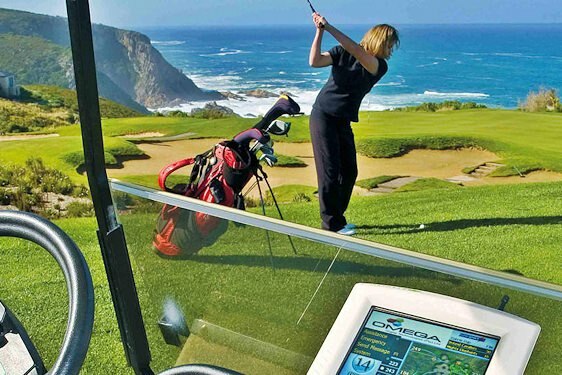 Pezula Golf Course is set on one of the famous Knysna Heads, no more than ten minutes from the center of town. 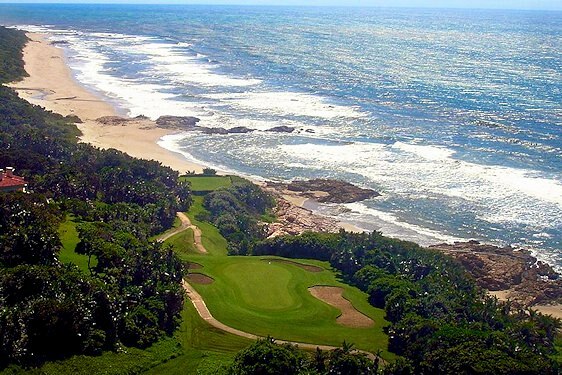 This championship golf course offers an inspiring setting overlooking the Indian Ocean. Pezula is sure to challenge and delight all who tee off on this fine golf course. When the Pinnacle Point Golf Course opened in 2006, Golf and Leisure magazine rated it as one of South Africa's best new golf courses. 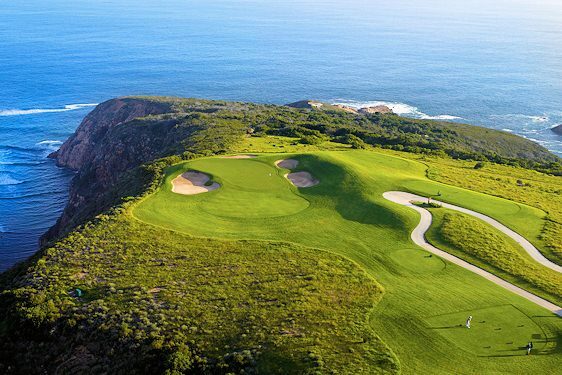 Pinnacle Point has since lived up to these high expectations by providing an unforgettable golfing experience in South Africa's Garden Route. Plettenberg Bay Golf Course is surrounded by a small nature reserve in the prime coastal resort town of Plettenberg Bay, one of the Garden Route's most popular holiday destinations. When playing this South African golf course, you are sure to enjoy the rich bird life with which the area is blessed. 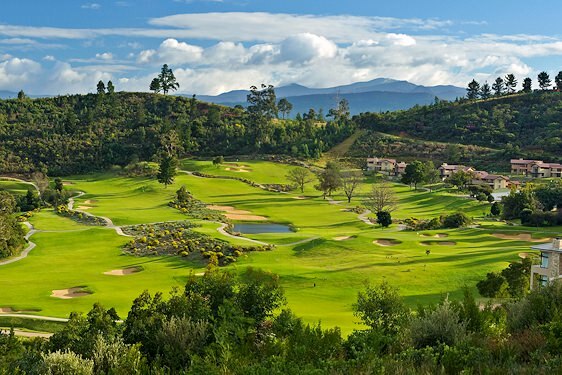 Simola Golf Course is set in an indigenous forest close to the town of Knysna. It is the first signature Jack Nicklaus course to be developed on South Africa's Garden Route. 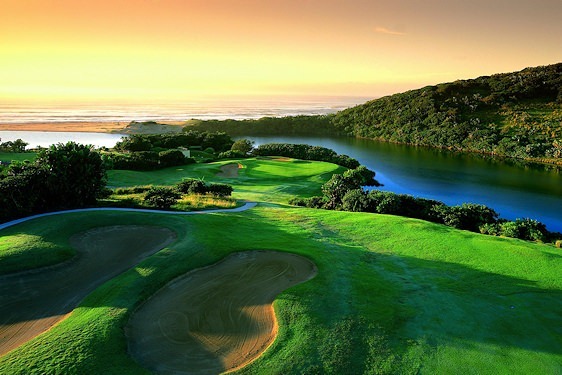 Each hole has sweeping views across either the Knysna Lagoon or the Knysna River. Pretoria Country Club can be found in the suburb of Waterkloof, one of Pretoria's most affluent areas. 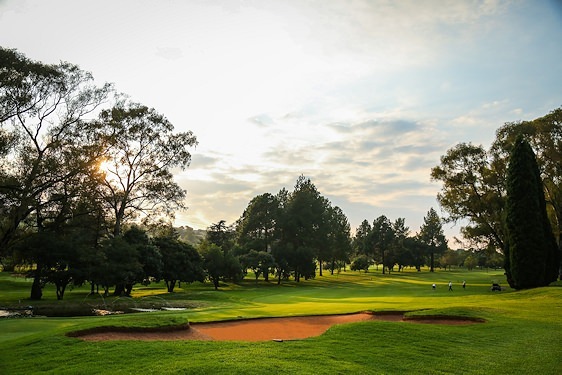 Though Pretoria Country Club was officially opened in 1910, this Gauteng golf course had a major revamp between 2004 and 2005, creating the wonderful parkland layout enjoyed by golfers today. The Royal Johannesburg and Kensington has two superb parkland layouts; the East and West. 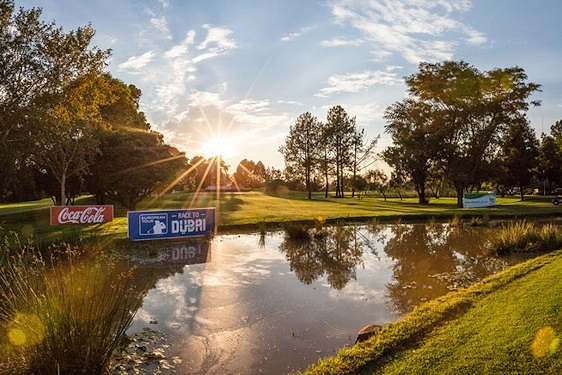 The East is regarded as the Royal Johannesburg's championship course. It has staged the South African Open on seven occasions and hosted two commonwealth amateur tournaments. Peter Matkovich endowed the Silver Lakes Golf Course with several risk and reward features that make a round on this course very enjoyable. This Gauteng golf course is set in a residential estate on the eastern outskirts of Pretoria, approximately forty minutes from OR Tambo International Airport in Johannesburg. You will find the Wingate Park Country Club in the leafy eastern suburbs of Pretoria. Wingate offers a well-manicured golf course that is dotted with large trees and flowering shrubs, creating a welcoming, peaceful environment. Woodhill Golf Course boasts a Peter Matkovich design in one of the most prestigious golfing estates in the northern part of South Africa. The course played host to the 2001 PGA Championship, and many of the pro's will attest to the fact that Woodhill gave them a good run for their money. 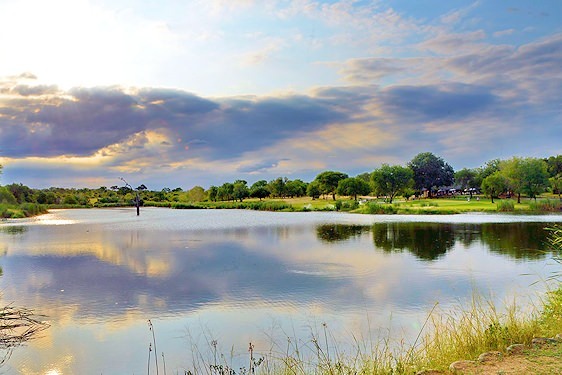 The Kruger Park Lodge golf course's biggest drawing card is its proximity to the Kruger National Park, providing visitors with the opportunity to enjoy exciting game drives in between rounds. 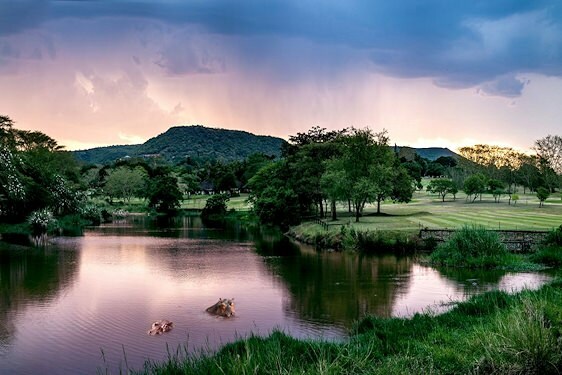 With a leisurely 9-hole par-36 course designed by golf legend Gary Player, the Kruger Park Lodge offers the ideal opportunity to convert your Kruger National Park golf experience into a Kruger National Park golf safari. 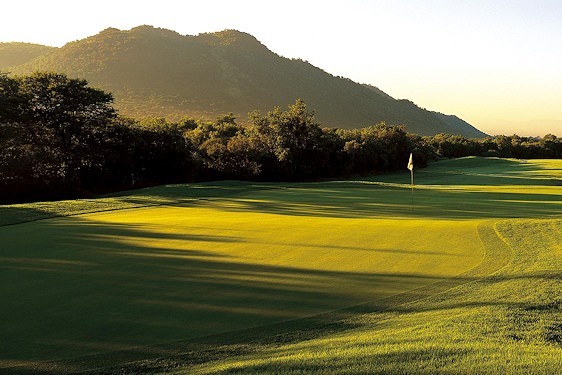 Leopard Creek Country Club is by far the most prestigious of the golf courses surrounding the Kruger National Park. With the exclusivity of a member or by-invitation-only policy, the only exceptions are allotted to the guests of a handful of nearby luxury lodges. 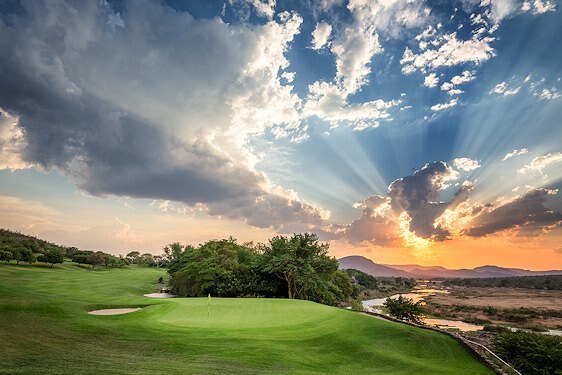 Leopard Creek offers a unique Kruger National Park golf experience, allowing players to enjoy the spoils of this Gary Player-designed golf course while observing a wealth of wildlife converging around the waters of the Crocodile River. The Sabi River Sun's golf course is located a mere half an hour's drive from the world-renowned wilderness of the Kruger National Park. A handful of hippos and crocodiles occupy a few of the waterways around the course, so be wary when fetching wayward golf balls! After enjoying an 18-hole round of play on this parklands-style course, head off into the park for the safari experience of a lifetime. 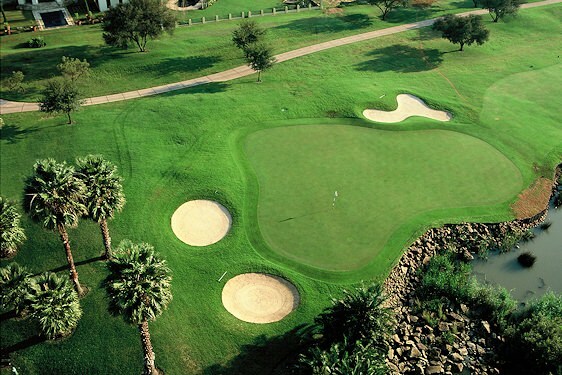 Skukuza Golf Club may offer a very basic 9-hole course, but the experience is indelibly enhanced by the fact that it is located inside the Kruger National Park itself. Only a few minutes away from its namesake rest camp, Skukuza Golf Club is often visited by surrounding wildlife, adding a healthy dose of excitement to a leisurely round. In your spare time, enjoy safari game drives in the surrounding Big Five wilderness to reap the full benefits of this Kruger National Park golf experience. White River Country Club is located within convenient proximity to many of the Mpumalanga province's most exciting attractions, including the Blyde River Canyon, Sudwala Caves, Pilgrims Rest and, of course, the Kruger National Park. Combine a round or two on the 18-hole championship-style parklands course with a Big Five game drive in one of the continent's finest conservation areas. 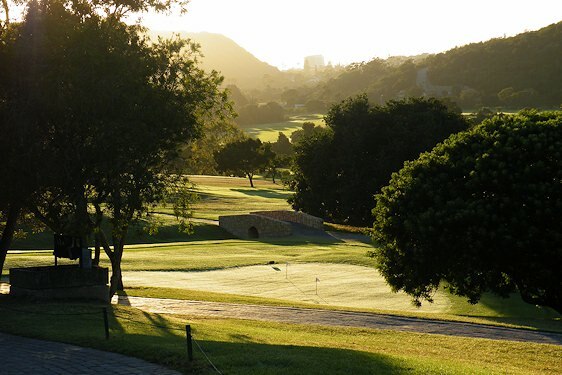 Durban Country Club offers a challenging round of golf for visitors to this exciting coastal city. 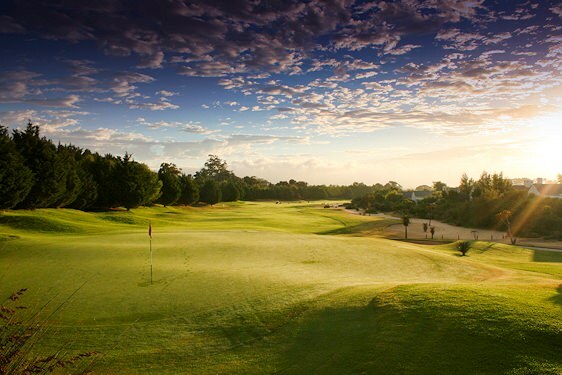 The course is just over 90 years old and has hosted the SA Open a whopping 17 times. The more elevated holes enjoy stunning views of the lagoon, the Indian Ocean and the illustrious Moses Mabhida Stadium. The city itself offers beautiful beaches and exciting attractions such as uShaka Marine World and The Golden Mile's bustling promenade. 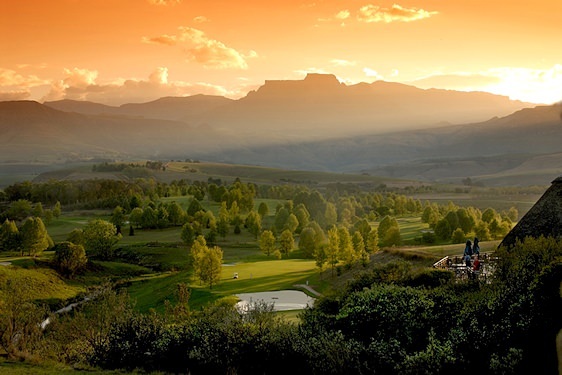 Champagne Sports Resort's golf course sprawls its fairways across Champagne Valley in the Drakensberg. 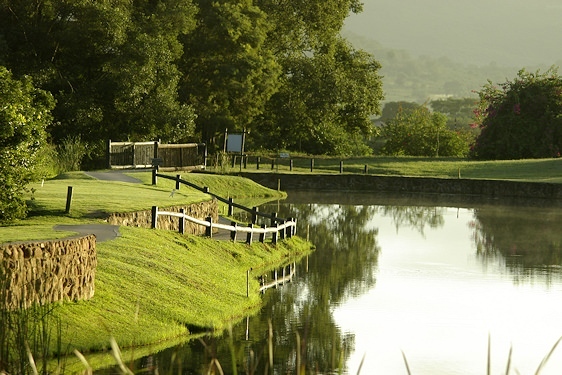 Truly one of the most scenic regions to enjoy a round of golf, Champagne Sports Resort's parklands-style course provides avid golfers with the opportunity to combine their KwaZulu-Natal golf tour with a range of exciting outdoor activities, including hiking in the breathtaking surrounding area. Mount Edgecombe Country Club is located just around the corner from Umhlanga Rocks, one of the most popular beachside towns in KwaZulu-Natal. 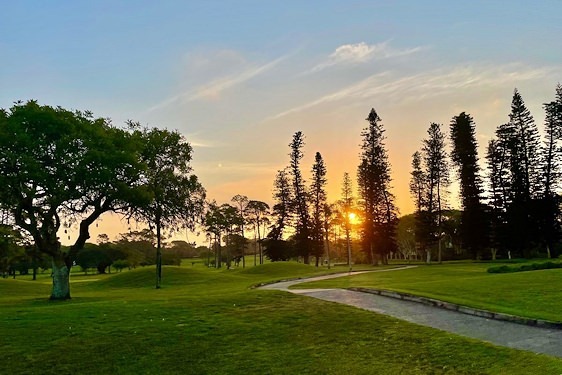 The country club boasts two golf courses enriched by Natal's striking natural greenery, both of which were redesigned by professional golfer Hugo Baiocchi in recent years. 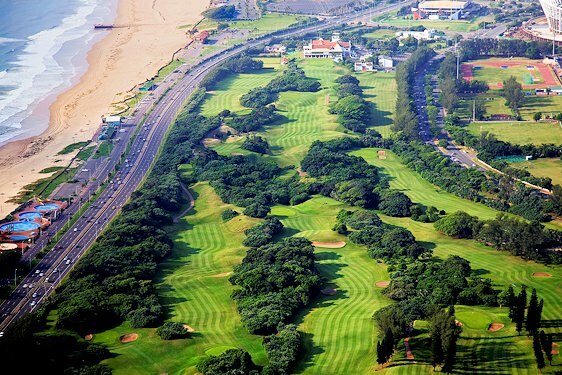 Prince's Grant's parklands/links combination course lies just north of the city of Durban. 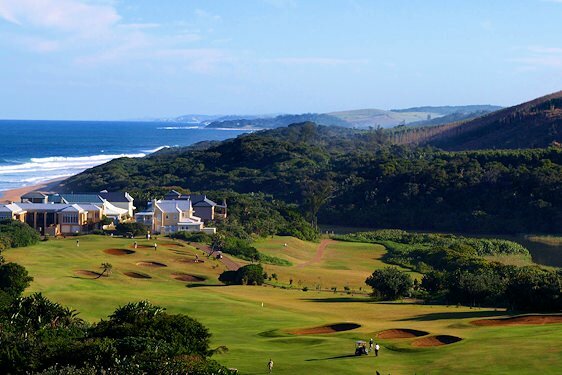 Surrounded by thick coastal vegetation, this scenic KwaZulu-Natal golf course was designed by Peter Matkovich and Dale Hayes. Views alternate between the rich blue of the Indian Ocean and tall, shady trees. San Lameer Country Club forms part of an esteemed coastal retreat on the shores of the Indian Ocean. 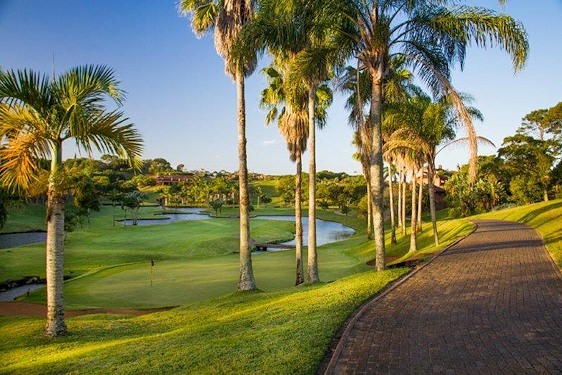 With its tall palm trees and scattering of indigenous antelope, San Lameer offers one of the most handsome golf courses in the KwaZulu-Natal province. Use the opportunity to combine your leisurely golf tour with a relaxing beach holiday. 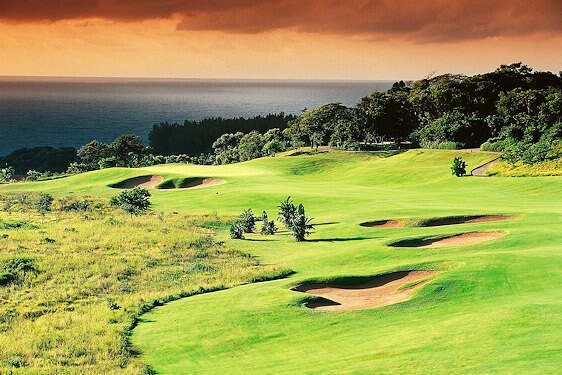 Simbithi is a parklands-style Peter Matkovich-designed course near the coastal resort town of Ballito. As with KwaZulu-Natal's myriad other courses, Simbithi is enhanced by its glorious natural setting. Though a slightly smaller par 60 course, Simbithi nevertheless offers engaging play and a truly satisfying round of golf. Southbroom Golf Club offers breathtaking views of the southern Indian Ocean. The parklands course is endowed with indigenous sub-tropical forests, ceding hours of bird song and the occasional sighting of small antelope. The course is popular among visitors to the area as it also boasts a grand swimming beach. Wild Coast Sun is a Sun International Resort near the South Coast town of Port Edward. The area marks the point where the wild Transkei of the Eastern Cape meets the sub-tropical shores of KwaZulu-Natal. If you are feeling 'lucky', combine your South African golf holiday with a few rounds of poker or blackjack at the Wild Coast Sun's casino. Zimbali Country Club is set in a lush coastal retreat with enviable beachfront real estate. The links/coastal-style course was designed by PGA champion Tom Weiskopf. 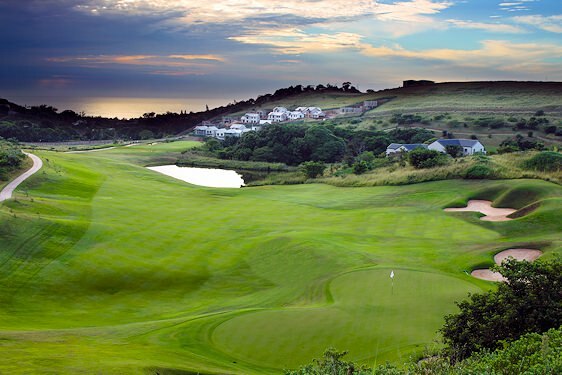 Zimbali combines luxury accommodation, spectacular natural scenery and a championship golf course to produce an inimitable golf getaway in KwaZulu-Natal. 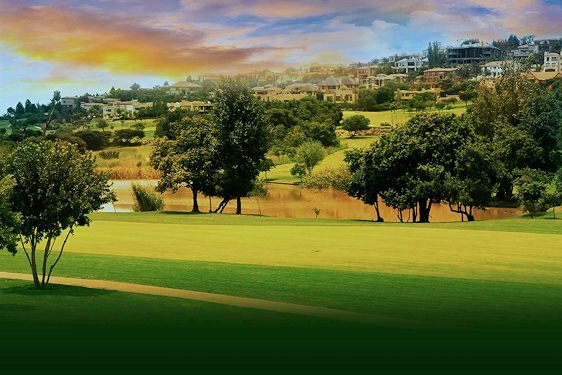 The Gary Player Golf Course is home to Sun City's annual Nedbank Golf Challenge, a prestigious event that gathers golf aficionados from all over. A round on the parklands-style course may easily be combined with a Big Five safari in the nearby Pilanesberg Game Reserve for additional excitement. The Lost City Golf Course is known for a rather unique water hazard that hosts a handful of young Nile crocodiles. 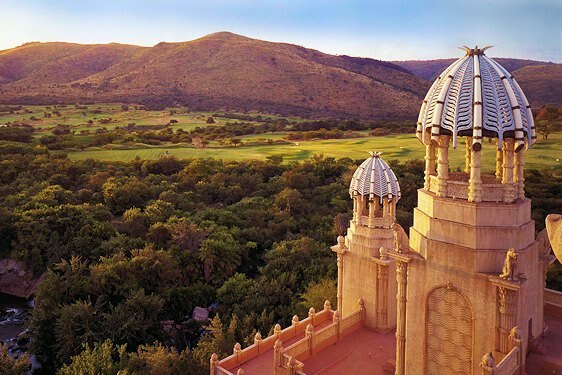 This Sun City golf course was also designed by Gary Player and is surrounded by the breathtaking bushveld of Pilanesberg. The resort itself offers a wealth of entertainment for guests of all persuasions. 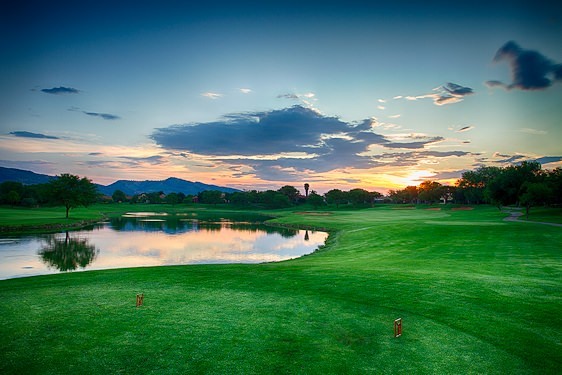 Only an hour from Johannesburg, Pecanwood Golf and Country Club may not be a Sun City golf course, but its position on the fringes of the North West province classifies it as such. This Jack Nicklaus parklands-style course boasts beautiful views of the Hartbeespoort Dam and surrounding Magaliesberg mountains. South Africa is one of the continent's top travel destinations. Botswana offers some of the finest safari experience imaginable. Namibia is a vast, desert country with unique wilderness areas like Etosha National Park. Zambia is known for its remote wilderness areas, like Kafue and South Luangwa. Mozambique's myriad fine beaches and islands make it a top African travel destination. Our beach vacations transport travelers to fine sandy shores, turquoise blue waters and far-flung island lodges offering a wealth of water sports. South Africa offers a wide variety of family vacation destinations, from Sun City and Madikwe to Cape Town and the Garden Route. Almost all of Southern Africa's top safari areas boast at least one luxury lodge to augment your game viewing experience. Our luxury train journeys on the Blue Train and Rovos Rail invite travelers to opt for the scenic route while enjoying fine dining and plush accommodations.